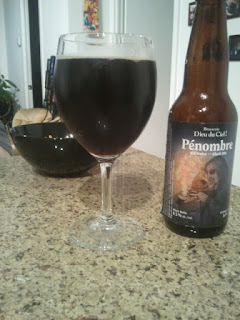 In choosing a six pack to bring back from Quebec City, I thought my selection of Dieu Du Ciel's Pénombre Black IPA was a strong choice. 6.5%, but tasted like a 4%. Why, you ask? It was really syrupy. Quite sweet really. IPA? Non. Not in the traditional strong hop flavor. Sure, I'm no cicerone, but I'd really like to understand how this is a black IPA when it tasted just like a chocolate espresso stout. Nonetheless, it is a decent beer. Great for dessert if you're having just one. Next time I'll pick up something from one of the smaller brasseries.